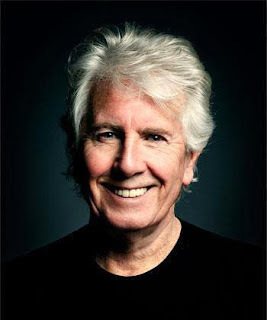 Graham Nash would like to tell you about a right jolly old elf. Photo from Graham Nash Facebook page. Couture Cupcake Cafe is having a grand opening celebration for its new location in Palatine tonight from 5:00 to 9:00PM. In addition to a variety of regular, gluten-free, vegan, organic and low-sugar cupcakes, the cafe will offer smoothies, wedding cakes, coffee, espresso, teas, and assorted cold beverages. Part of Couture Cupcake Cafe’s mission is to donate to local churches and charities. It’s currently raising funds to provide cupcakes to young patients in hospitals. It looks like Couture Cupcake Cafe’s Palatine location will be sharing space with the Rock n’ Roll Ala Mode ice cream parlor at 45 N. Bothwell. There’s another new location opening soon in Wilmette, and the original Couture Cupcake Cafe can be found in Kildeer. Now that he’s covered his career with The Hollies and Crosby, Stills And Nash in his recent Wild Tales autobiography, Graham Nash is ready to tell us about Santa Claus. He joins Emma Thompson, Jamie Oliver, and some successful Penguin Books UK authors in reading Clement Clarke Moore’s ‘Twas The Night Before Christmas as part of the publishing company’s holiday promotional film. The official Fender website has some fun gift ideas for musicians or people who enjoy music. One of my favorites is the Fender Custom Shop lunchbox. I saw one through the window at The Music Room in Palatine, and immediately knew it had to be on my wish list this year. You can also buy a guitar shaped cutting board at The Music Room, or find it and other instrument-related accessories and trinkets online at Fender. The Hard Rock Cafe Shop on Michigan Avenue has a new limited edition t-shirt that honors John Lennon with its “Imagine There’s No Hunger” slogan, and will help fight child hunger around the world through the Grassroots Solutions organization. It was made with permission from Yoko Ono. The design on the dark chocolate colored t-shirt also features a hand flashing the peace sign and the Hard Rock Cafe logo. Singer-guitarist Madeline Adams will be performing original songs, including tracks from her 2006 album, The Slow Bang, at Café Mustache on Thursday, December 12th. Originally from Athens, GA, Adams is also a graphic artist, and is currently offering a special package deal combining a vinyl edition (with download code) of The Slow Bang, her long-out-of-print ’zine What The Devil Don’t Know, and a custom-designed pillowcase for $25. The Slow Bang is also available by itself in CD or LP format for $12. Bill Tucker and blues rock singer-songwriter Shaina Hoffman will also be on next Thursday's bill at Cafe Mustache. Kim Shattuck may have been pushed out of The Pixies, but she’s rebounded nicely with her original band, The Muffs. The trio has a gig at The Satellite in Los Angeles on December 21st. Peach Kelli Pop and honeychain are also on the bill.